As we continue walking the Lenten path together, I'm continuing to keep company with poets. Poetry is all about spaciousness, saying just enough and letting the rest be. What better Lenten discipline could there be? and the sparrow a nest for herself. open my eyes to your love. and merge their will in your will. Brendan Curran and Jana Yeaton share reflections throughout March, with Brendan exploring the parable of the Prodigal Son this week (Luke 15:1-3, 11-32). Jason Long continues to walk us through the experience of small groups as a spiritual practice. Come share dinner and a passion for justice with the Hope in Action @ The Crossing team. This crew of Crossing members is helping our whole community to stand up for justice, especially supporting transgender civil rights and homeless LGBT (lesbian, gay, bisexual and transgender) youth. On Sunday, we will learn together about 1) the scriptural and theological foundations for LGBT inclusion, 2) effective ways to advocate for and with LGBT youth, and 3) then write letters to the Mass. State Legislature. CONTACT: Tyler Bridge at tyler@diomassintern.org or Natalie Finstad athope@thecrossingboston.org. FYI: This gathering will be in lieu of the Sunday night Bible Study. NEXT THURS., 3/18 after worship // Everybody Does Theology -- Topic: "What Happened on the Cross?" Stay after worship for our monthly, wide open discussion of big theological questions. Just in time for Holy Week, we will discuss the cross, sin and atonement. This is gonna be good! CONTACT Keith Nelson at nelsonkr@gmail.com or Marie Harkey at worship-arts@thecrossingboston.org. 1340 Boylston St., Boston, 8 min. walk from Kenmore or Fenway T.
Dani Morello hosts the next dinner at her home in Brookline and all are welcome to join. Be warned: her cupcakes will have you shouting "alle--a!" well before Easter. RSVP to Dani at morellda14@gmail.com. LOCATION: 26 Verndale St., Brookline (two blocks from B Line, Harvard Ave. stop). The entire Cathedral community will join us for a reflective service that commemorates Jesus' last night with his friends. Features Agape Meal, foot-washing and stripping of the altars. Help us to welcome the Chinese congregation, the Cathedral Sunday morning congregation and the Common Cathedral ministry with homeless people. CONTACT Marie Harkey at worship-arts@thecrossingboston.org to help with planning or greeting. The Easter Vigil is the most ancient and beloved service in the church. 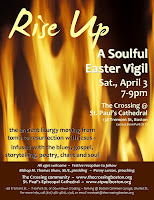 Our Soulful Easter Vigil shares the ancient story of creation and redemption -- retold by local storytellers and poets, set to spirituals and the blues. Then we burst into a music-rich celebration of the first Eucharist of Easter. Bishop Tom Shaw will celebrate -- his first time with us at The Crossing! -- and several Crossing members will be welcomed into the Episcopal Church. CONTACT Rev. Steph atrevsteph@thecrossingboston.org to help with planning, greeting, hospitality or storytelling. These new small groups are dedicated to building community, sinking roots into our neighborhoods and engaging in justice and service to bless the communities where we live. Meet every other week, alternating between sharing stories and community in one gathering, and heading into action the next time. CONTACT Justin at justice@thecrossingboston.org to learn more. Follow this link to learn all about our Small Groups and Formation Offerings or contact our Minister for Community Life, Jason Long, at community-life@thecrossingboston.org.